Calf in a bath or a dog in a bath, either way we can repair your damaged bath. 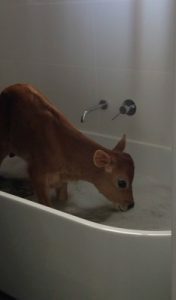 When a bathroom renovation company decided to film a calf inside a brand new freestanding bath they didn’t think of the damage that would occur. The damage resulted in long scratches on the base of the bath which weren’t too deep, but deep enough that when touched the abrasion was noticeable. Damage of this kind normally comes from scratches caused by dog washing. So whether your scratched bath is a result from dog toenails when washing your dog inside the bath or a ‘Calf in the bath’ the Australian Acrylic Repairs team can repair the bath to as new. So if you’re finding your candle lit baths are not the same as they used to be before washing your pet in the bath, then contact us for an affordable solution to repairing your bath to look and feel like new. We thought this story was too cute not to share.